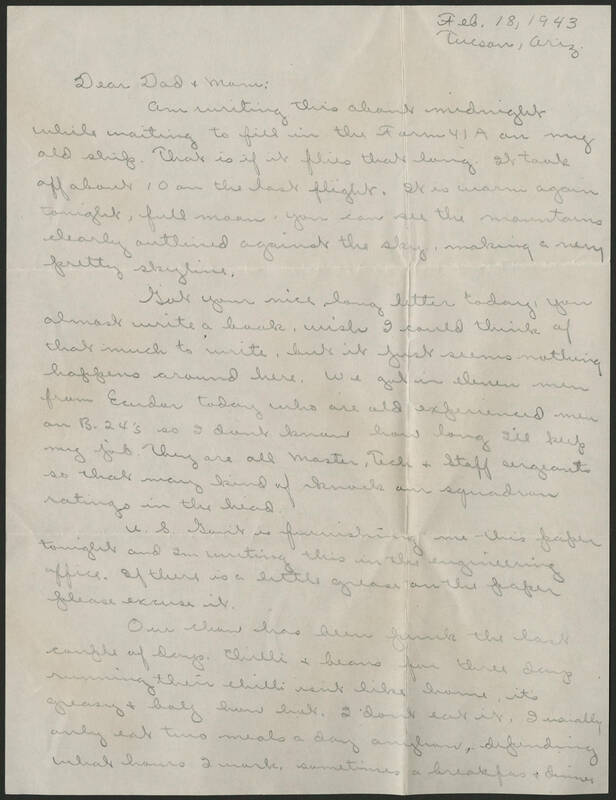 Feb. 18, 1943 Tucson, Ariz. Dear Dad + Mom: Am writing this about midnight while waiting to fill in the Farm 41 A on my old ship. That is if it flies that long. It took off about 10 AM the last flight. It is warm again tonight, full moon. You can see the mountains clearly outlined against the sky, making a very pretty skyline. Got your nice long letter today, you almost write a book, wish I could think of that much to write but it just seems nothing happens around here. We got in eleven men from Ecudor today who are old experienced men on B-24's so I dont know how long I'll keep my job. They are all Master, Tech + Staff Sergeants so that may kind of knock our squadron ratings in the head. U.S. Gov't is furnishing me this paper tonight and Im writing this in the engineering office. If there is a little grease on the paper please excuse it. Our chow has been pink the last couple of days. Chilli + beans for three days running their chilli isnt like home, its greasy + [illegible] but I dont eat it, I usually only eat two meals a day anyhow, depending what hours I work, sometime a breakfast + dinner.